Little Disney fans will love to role play in Mickey Mouse’s Workshop. The big red car provides hours of fun and there are special bricks decorated as tools, sandwiches and a workshop sign to help them start their own stories. It’s easy to build with the brightly colored LEGO® DUPLO® bricks designed especially for budding builders. Includes a DUPLO figure: Mickey Mouse. This comes down to 138.83 cent per brick. The Mickey's Workshop (10829) Lego set is no longer directly available from the sites below. However, 3rd party partners of these sites might still have the set available. 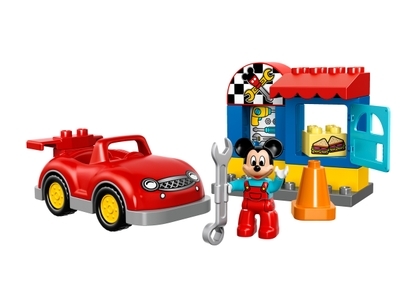 Alternate description Fix the cool red car in Mickey Mouse’s Workshop with opening door, wrench, traffic cone, decorated bricks as story starters and a LEGO® DUPLO® figure: Mickey Mouse.